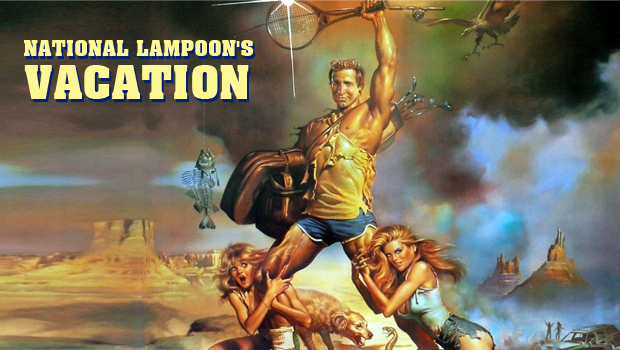 With the upcoming release of Vacation, a semi-reboot/continuation of the franchise, there had to be a look back at the original from 1983, the tale of Clark Griswold and his family’s travels across the country in National Lampoon’s Vacation. The premise is relatively simple; Clark Griswold (Chevy Chase) wants to spend more time with his wife (Beverly D’Angelo) and his children Rusty (Anthony Michael Hall) and Audrey (Dana Barron). To accomplish this, he purchases a station wagon to embark on an expedition from Chicago to the LA theme park, Walley World. Much of the plot revolves around the numerous mishaps that occur on the over two thousand mile journey. Chevy Chase makes Clark Griswold a perfect square while providing a tongue-in-cheek sort of style that doesn’t ever become insulting. The rest of the family around him is just as amusing and feels very real when it comes to their family dynamic. By far the funniest moments from the film come from cousin Eddie (Randy Quaid). Even though his time in the film isn’t too long, the deadbeat cousin steals the scenes he is in and brings the comedy to its riskiest point throughout the film. Most of the gags are more subtle, though sort of cartoonish and witty. The screenplay by the fantastic John Hughes can be seen throughout Vacation’s type of witty yet simple humor. The timing of the gags becomes impeccable and the pace doesn’t have many faults under the direction of Harold Ramis.